Bitcoin the leading crypto coin over the last decade,has kept dominating the market up to this moment influencing other coins value.The fact is that the lunch of bitcoin triggered a blazing fire in the crypto world,we have seen and participated in different coin and token lunch.This has increased the trading volume in different blockchain and traffic,calling for also exchange site to carry out transactions. Most exchange sites present a bulky protocol to transact on the system,and little coin selection.we are happy to present an exchange site and coin conversion tool for all crypto investors and coin holders. we present to you OnePageX the future of crypto conversion and exchange site. 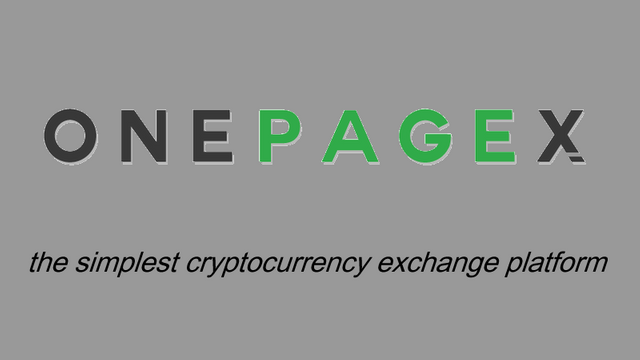 OnePageX is simple cryptocurrency conversion and exchange tool with a wide variety of coins under its hold.This exchange platform do not require any sort of registration just log in to the site and carry on with yours transactions.The name OnePageX is a short form for OnePagexchanger. OnePageX user do not need to open an account with OnePageX and constantly log in to their accounts to transact on the exchange.Rather the site is registration free and every single detail that you need can be done on a single interface. OnePageX has about 150 + coins that traders can buy an sell 0n tthhe site. This tool call for the integration of this website on your site.you can do this by merely copying and pasting the address. There is also a bonus CateredContent Event to earn additional Steem!